Kenya is a country in East Africa, bordering the Indian Ocean in south east, neighboring countries are Ethiopia, Somalia, South Sudan, Tanzania, and Uganda. With an area of 580,000 km², the country is somewhat larger than Metropolitan France or slightly more than twice the size of the U.S. state Nevada. 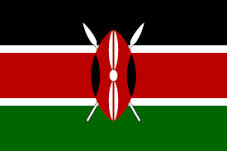 Kenya has a population of 43 million people (2014). Spoken languages are Swahili and English (both official), and numerous indigenous languages mainly Kikuyu and Luhya. Largest and most populous city and the national capital of Kenya is Nairobi. Second largest city and the country's chief port is Mombasa. Kenya's climate varies from tropical along the coast to arid in interior. Kenya's landscape varies from low plains near its coast at the Indian Ocean, to a fertile plateau in west. The country's interior is dominated by the central highlands with the country's highest point Mount Kenya at 5,199 m. The highlands are bisected by the Great Rift Valley, a large natural depression that runs through Kenya with a north to south orientation, within the Valley is a chain of volcanoes, some of them are still active. North of the Kenyan Rift Valley lies Lake Turkana, formerly known as Lake Rudolf. It is the world's largest permanent desert lake. The Lake Turkana area is regarded by many anthropologists as the cradle of humankind due to the abundance of hominid fossils. 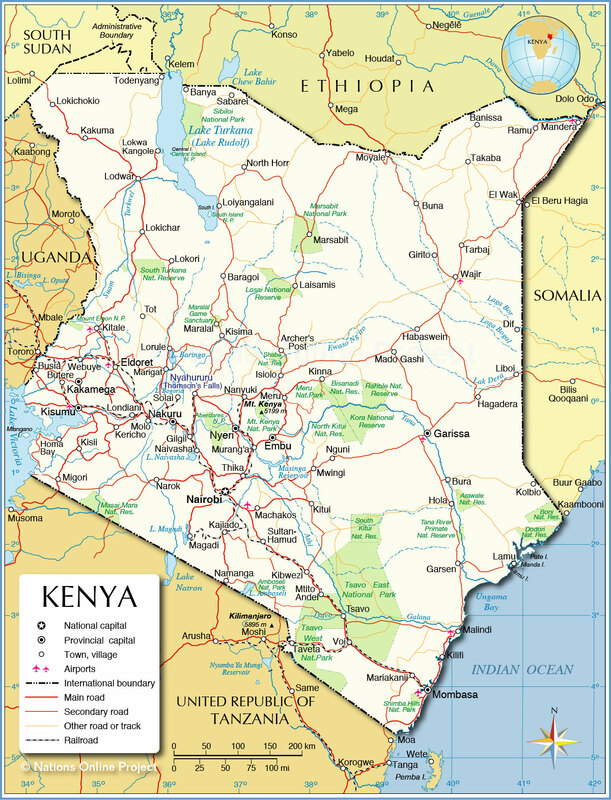 Map is showing Kenya and the surrounding countries with international borders, the national capital Nairobi, province capitals, cities, main roads, railroads and major airports.